ACE Billiards provides many services to the public including restorations, removals and storage. Tables are available for overnight/party hire as well as long term hire. While most of our hire tables are based on the Premier model, this picture shows one of our hire specialties. This table has been stained white and fitted with blue cloth and chrome fittings. It has been quite popular for use at engagment parties and weddings and serves as a change of pace from the traditional colours. Reclothing of tables can be performed at your home or in our factory, using high grades of imported English cloth with many colours available at no extra charge. 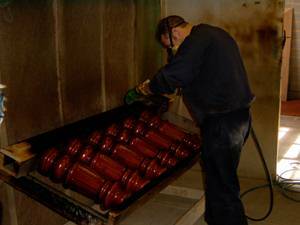 All aspects of restoration work are catered for at ACE Billiards. 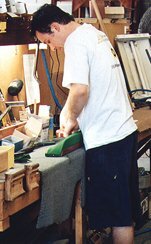 New rubbers, brass pocket brackets, nets and tooling leathers, and repolishing are just some of the services provided. Repairs to slate and frames can also be done. Moving house? Laying carpet? Buying a second hand table? Whatever the reason, ACE Billiards can move your table. Take the pain and worry out of Billiard table removal by enlisting our service which includes installation and levelling of the table so that it's ready for play. 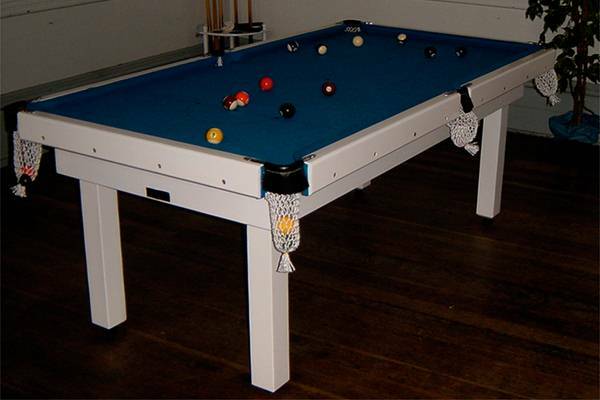 ACE Billiards provides a storage service for all sizes of tables. Whether short term or long term, renovations to your house or you just don't have the room anymore, your table will be cared for in a safe, fully insured environment.